Is Bangladesh’s Ban on Jamaat-e-Islami Democratic? The banning of a controversial Islamic party has sparked heated debate over democratic principles. Last week, in a landmark judgement the Bangladesh High Court deregistered the Islamic fundamentalist party, Jamaat-e-Islami (JeI), thereby banning it from participating in future elections. This is a further blow to the fundamentalist group, which has been on the receiving end of the war crimes tribunal. The tribunal has sentenced some of the party’s top leaders, including Abdul Quader Mollah, for crimes committed during the nation’s liberation war in 1971. According to news reports, the court verdict came in response to a writ petition filed by a little-known religious group, the Tarikat Federation, which claimed Jamaat should be disqualified as a political party because its charter, which acknowledges the absolute power of God, violates the constitution. In protest, Jamaat called a two-day general strike, sparking violent protests across the country. Jamaat has always been a sore point for overwhelmingly secular Bangladesh because of its highly negative role during the nation’s liberation war and subsequent political subversion and hardline religiosity. With a small but significant support base among the rural population, the group commanded four to five percent of the vote in the 2009 elections. This makes Jamaat an attractive partner for the main opposition party, the Bangladesh Nationalist Party (BNP), a rightist organization which shares with Jamaat antipathy towards the ruling Awami League (AL). The International Crimes Tribunal (ICT) that is hearing the cases for war crimes committed in 1971 recently sentenced two BNP leaders and is holding six Jamaat leaders, including chief Ghulam Azam, who has been sentenced to 90 years in prison for committing crimes against humanity. The ICT called Jamaat a criminal organization for its “anti-national” activities during the liberation war. 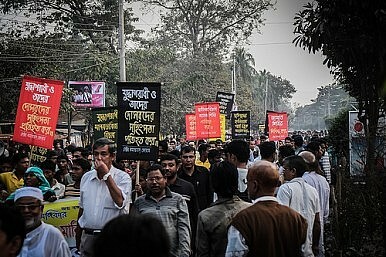 Earlier this year, Bangladesh witnessed mass demonstrations at Shahbag Square in the capital city of Dhaka. The protesters were demanding a ban on the fundamentalist organization and the hanging of war criminals. The cry for unassailable assertion of secularism in the predominantly Muslim republic has pushed fundamentalist organizations like Jamaat into a corner. The High Court’s verdict has come as a bolt from the blue for the Islamic group and has further polarized opinion in the country. Some in the BNP view the verdict as an attempt to subvert liberal democracy. But exiled Bangladeshi writer, Taslima Nasreen, who has been at the receiving end of the fundamentalist groups’ ire for raising the issue of minority safety in her novels, feels that the ban on the organization is “great news”. There is also another side to this issue. With general elections in Bangladesh expected in the next six months, the ban on Jamaat’s participation in the electoral process has supercharged the atmosphere in the country. The BNP, an alliance partner of the fundamentalist group, views the court’s decision as an attempt to help the ruling party and rig the elections by banning political organizations. Some political analysts feel that the ban on Jamaat will consolidate the hardliners’ vote behind the BNP, thereby helping the Opposition grab power in Dhaka. But the point is not who stands to gain in the poll. The larger issue is Bangladesh’s continuous battle to preserve its democratic and secular spirit, the founding principle upon which the country broke away from Pakistan in 1971. Through its political practices Jamaat has tried to radicalize a largely secular country with moral and material help from patrons in Pakistan and other Islamic countries. The party is at odds with the country’s history. Still, the question remains: Can a democracy stamp out an ideology by banning it, rather than engaging it politically and testing its strength in the electoral arena?